Since delivering a great horror comedy hit with Zombieland back in 2009, I've been waiting for director Ruben Fleischer's follow-up 30 Minutes or Less. Though the comedy won't actually hit theaters until August 12th this year, we finally have our first look at the film by way of a small batch of photos. Jesse Eisenberg and Aziz Ansari lead the story about of a junior high history teacher (Ansari) and a pizza-delivery man (Eisenberg) who are forced to rob a bank when one of them is strapped to a bomb vest. We'll be posting a report from my set visit soon, so stay tuned for that. In the meantime, see the photos below! 30 Minutes or Less is directed by Ruben Fleischer (Zombieland) and written by Michael Diliberti. 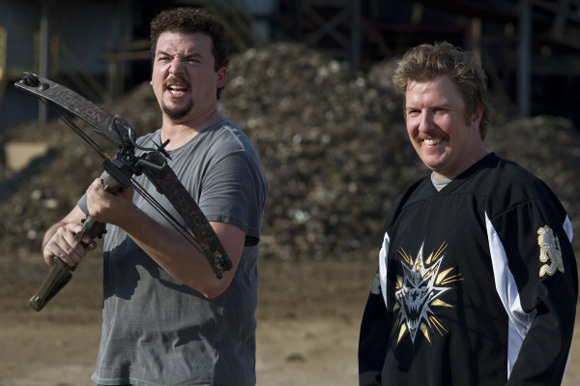 In the action-comedy Nick (Eisenberg) is a small town pizza delivery guy whose mundane life collides with the big plans of two wanna-be criminal masterminds (Danny McBride and Nick Swardson). The volatile duo kidnaps Nick and forces him to rob a bank. With mere hours to pull off the impossible task, Nick enlists the help of his ex-best friend, Chet (Ansari). As the clock ticks, the two must deal with the police, hired assassins, flamethrowers, and their own tumultuous relationship. The film hits theaters on August 12th this year. Sound good? McBride and Swardson? I'm in. Marry me, Eisenberg. LOL IS THAT WEIRD? I think it's weird. I love Jesse Eisenberg. I'm in as long as Nick does some Gay Robot. Every time i come to this site i am hoping there is a trailer for this movie out, this gives me hope that its coming soon. shits gonna be gold.